If your business premises produces this type of waste, you CANNOT put it in the general waste bin and must have it separately collected under Hazardous Waste consignment procedures. If your site is in Wales and generates >500kgs of hazardous waste per year, you must register as a hazardous waste producer to get a premises code for use on consignment notes. PLEASE NOTE THAT FROM 1 APRIL 2016, SITE REGISTRATIONS ARE NO LONGER BE REQUIRED IN ENGLAND. More details can be found here. The EA has a public register where you can look up a company's premises code if they are registered. SITES IN SCOTLAND AND NORTHERN IRELAND DO NOT NEED TO BE REGISTERED. The EA has two (July 2013) Guides for household and small business waste for a quick determination whether something is hazardous waste. But for more complex wastes and for the new Hazard Property codes, you need to refer to WM3 (applicable from 1 July 2015) which defines hazardous waste in much more detail and gives all the relevant thresholds..
An EA has produced a list of Guides for Hazardous Waste Management. These are no longer listed on GOV.UK but can be helpful. We have added in the GOV.UK guide on the new consignment notes below the previous Guidance below. The EA also publish additional Guidance on various issues - such as the length of time between collection and deposit at a consignee - here. The EA recently (Feb 2018) updated Guidance on the movement of small quantities of hazardous waste produced by mobile engineers. The Diffuse Network Infrastructure Guidance applies to situations such as the changing of street lamps, maintaining railway track or phone exchanges etc and allows the use of a summary consignment note but only where specific conditions are met. Unfortunately, this only applies to sites that classify as Diffuse Network sites. For mobile maintenance engineers who might remove small quantities of hazardous waste from each site, the situation seems variable between administrations. The EA/NRW's position is that there must be a consignment note for every movement and that the engineers should dispose of the waste 'promptly and without undue delay', normally within 24 hours. NIEA's position is that consignment notes are not expected on the initial movement, just from the first point of storage. The classification of packaging that has contained hazardous materials is often extremely confusing. This Guidance - produced by a number of organisations and supported by the Agencies - was published in July 2017. In essence, 'empty' packaging containing residues is classed as hazardous packaging (15 01 10*), whilst packaging containing more than residues is classed by the EWC code of the contents. You must assess risks posed by any hazardous substances that you store on your site, including hazardous waste, and take steps to control those risks. The movement of Hazardous Waste between two sites - regardless of whether the sites belong to the same business or the waste is owned by the carrier - must be accompanied by a Consignment Note. For England and Wales, no pre-notification is required. In Scotland and NI, a three day notification process still applies. England and Wales now operate different Consignment Notes. England - a modified Consignment Note is now required that has removed the premises code and requires a SIC 2007 code. Wales - the previous Consignment Note (bottom of page) should still be used that includes the premises code and uses the SIC 2003 code. In both cases, the Consignment Note must be used for both single and multiple consignments. The note requires the use of Recovery and Disposal Codes and Hazard Codes. They must contain the correct EWC codes and a valid SIC code (2007 for England, 2003 for Wales). And where they are used for waste that must be transported under Carriage of Dangerous Goods, they must show the UN Code(s). If you receive Hazardous Waste, you are a Consignee. In England and Wales, consignees have to submit quarterly Consignee returns to the EA listing all the consignments they have received with a payment of an EA fee per consignment - £10/single consignment and £5/multiple consignment (where they are submitted electronically). Details of this process can be found in HWR04 above. This derogation can only be used when the waste is moved from the original producer. Second and subsequent movements must still conmply with normal consignment procedures. Where these wastes are received, consignee returns should be completed according to these instructions. The requirements for dealing with Hazardous Waste are different in Scotland and Northern Ireland to England and Wales. For England and Wales, hazardous waste is dealt with under the Hazardous Waste Regulations (amended under the Amendment Regulations 2009 which imposes the 500kg exemption threshold, more recently by the Waste (England and Wales) Regulations 2011 that removed multiple collection consignment notes) and most recently, by the 2016 Amendment Regulations that remove the premises code requirement. Any business in Wales that generates more than 500 kgs/year of waste classed as ‘Hazardous’ under the European Waste Catalogue (EWC) must register as a hazardous waste producer with Natural Resource Wales before they can have hazardous waste collected from their site. There are exemptions. Where a site produces less that 500kgs per year, it does not need to register and can have its hazardous waste collected without a registration number. THIS IS NOT REQUIRED IN ENGLAND FROM 1 APRIL 2016. All registered sites are listed on the EA public register (will not apply in England for sites whose registration lapses after 1 April 2016). An EA explanation of which sites should be registered can be found here. For Scotland, hazardous waste is controlled by the Special Waste Regulations, is still known as ‘Special Waste’ and must be consigned - SEPA have produced a comprehensive Guide. A business that produces special waste (the same as hazardous waste in England and Wales) does NOT have to register their site. Instead, there is a pre-notification procedure where the company that is asked to collect the waste must submit a notification to the Scottish Environmental Protection Agency 3 days in advance of the collection except for lead-acid batteries or subsequent collections of the same waste. Notification can now be paid for online and users can opt for a consignment note or just the number if they wish to do their own consignment note. SEPA has a range of advisory notes on the handling of special waste. 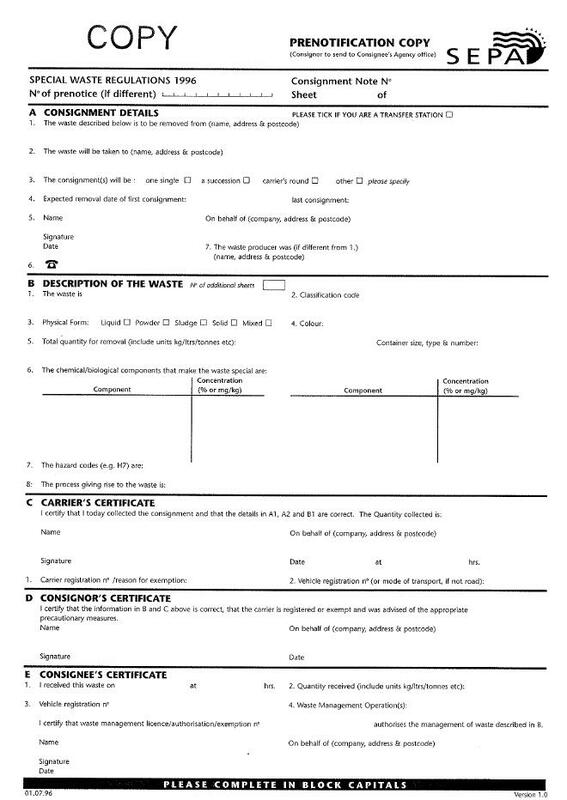 A Scottish Consignment Note template is available here and a Carrier's Schedule here. For Northern Ireland, the Hazardous Waste Regulations have replaced the Special Waste Regulations, but the system operates very similar to before and to Scotland - pre-notification and consignment notes. A Guidance Note explains the requirements with a more comprehensive Guide here. For each consignment, a fee must be paid to the relevant Agency. In England and Wales, the charge is £10/single consignment and £5/consignment collected on a milk round (multiple collection) where payment is made online. In Scotland and Northern Ireland, the fee is up to £15/consignment depending on applicability.